The Ashalim power plant concentrates sunlight to produce high-temperature steam for turbine-generated electricity production. The new Ashalim solar power plant in the Israeli Negev desert relies on local fresh water sources for its cooling-tower make-up water. The Israeli government was looking for a solution that would enable the reuse of treated blowdown wastewater as make-up and ultrapure water (UPW) and minimize discharge to the evaporation ponds. This case study shows how Fluence designed and manufactured a multistage water treatment system to produce water for the cooling system, as well as ultrapure water for the steam boiler. With a target completion date of end of 2017, the Israeli government has been working with GE-Alstom and BrightSource Energy to build its first utility-scale concentrated solar power (CSP), or solar thermal plant in the country. 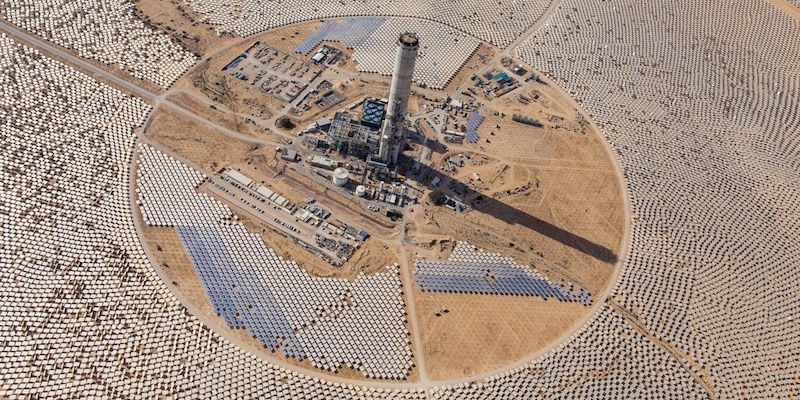 Located in Israel’s southern Negev desert, the plant is one of the largest projects of this type in the world, and includes 50,600 computer-controlled heliostats spread across an area of more than 3 km2. The solar panels concentrate sunlight a thousandfold onto a boiler mounted atop a 200-meter-high tower. The boiler generates high-temperature steam at high pressure. Pipes then convey the steam to a ground-level turbine generator, which produces 121 MW of solar electricity for the Israeli power grid. The Israeli government wanted to minimize the use of fresh water in the cooling cycle and boiler system, and limit excessive discharge of brackish blowdown wastewater into evaporation ponds. Fluence designed and supplied a containerized system to treat the cooling tower blowdown water for reuse and to produce ultrapure water (UPW) to feed the steam boiler. The containerized blowdown water treatment begins with pretreatment via an automatic disc filtration and ultrafiltration train. The water then circulates through first-pass reverse osmosis, and goes on to the demineralization process, which includes second-pass reverse osmosis, gas transfer membranes, and continuous electrodeionization. The Ashalim solar power plant blowdown water reuse system can take in 40 m3/h of blowdown effluent, producing 20 m3/h of makeup water for the cooling system, as well as 10 m3/h of ultrapure water for use in the steam boiler. For maximum reliability, Fluence designed the system with full duty-standby redundancy (2 x 100%), including a control system. The entire water treatment process is housed inside our NIROBOX™ system, consisting of modular containers, which require a minimal footprint and site work. The generation process continuously discharges brackish blowdown wastewater on-site. Without recycling, the system would dispose of the wastewater via dedicated evaporation ponds. Recycling the cooling water before discharge into the evaporation ponds saves valuable fresh water and reduces discharge volumes. Fluence’s cooling tower blowdown wastewater treatment process has led to a drastic reduction in the solar power plant’s fresh water needs and wastewater discharge volumes. The power plant has been able to meet its water use targets, reducing freshwater consumption by about 50% and effluent discharge by 80%. Contact our experts to learn more about how you can recycle cooling water systems blowdown wastewater to reduce consumption of fresh water and minimize discharge to the environment.